At my nutrition school, there are homemade vegan soups students can purchase. I always get one before every class. Sometimes there’s brown rice pasta soup. I’ve also eaten broccoli soup, cauliflower soup, and even pumpkin soup. I also enjoy homemade soups like kale and brown rice soup, carrot purée, and a Middle Eastern lentil soup made at my local health food store. I have also made my own lentil soup, which is loaded with carrots and tomatoes. You can also add in other vegetables such as leaks or celery. They are all delicious, and they are all “mmm…mmm…good.” Yes, I know that’s a Campbell’s Soup slogan; however, there’s nothing canned-tasting about homemade soups. How much soup do you eat on a daily basis? I’m not talking about canned soups that are full of preservatives, chemicals, and are unnecessarily packed with an abundance of salt. I’m talking about those homemade soups, which are packed full of vegetables, legumes, or whole grains. You’re not going to find that quality anywhere else. Why make your soup over the canned stuff? Many canned soups such as Campbell’s Soup contain the toxic chemical bisphenol A (BPA) which has been linked to health risks including neurological effects, reproductive abnormalities, diabetes, heart disease, and an increased risk for prostate and breast cancers. Fresher is always better. You can use fresh and organic vegetables for your soup, whereas who knows when your canned soup was made. My guess is probably months ago. You can even add local ingredients from your garden into your homemade soup in the late spring, summer, or early autumn. Be 100% sure that your homemade soup will be fresher than any can at the grocery store. Most soups keep for three to five days, and you even have the option of freezing a batch or two. If BPA cans help increase your risk for cancer, not consuming canned soups should surely help reduce your risk. Many ingredients found in soup can also help reduce your cancer risk. Ingredients such as garlic, onions, and cruciferous vegetables can all help reduce the risk of cancer. Soups with cabbage and kale contain glucosinolates, crambene, and indole-3-carbinol, which can potentially fight cancer, according to the American institute for Cancer Research. The allicin found in garlic can help stop the growth of cancer cells. The quercetin in onions has also been linked to preventing tumor growth and protecting colon cells from cancer-causing substances. The soy in miso soup can also help reduce your breast cancer risk. Antioxidants are also important to reduce many cancers and heart disease, which is another great reason you will benefit from homemade soup. Homemade soup is perfect for weight loss, especially if it has lentils. Lentils and vegetables contain an abundance of fiber, which will help you burn fat and increase your metabolism. 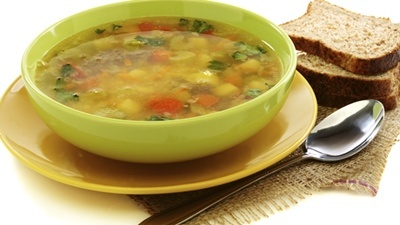 The combination of water and vegetables in your homemade soup are also essential for digestion. Overall, your homemade soup is low in calories and fat, which certainly can benefit weight loss. Research has shown that soup consumption keeps you full at the end of your meal, which means you will eat less later on. Have you ever wondered why you crave more soups in the winter? The temperature is a major influence on our health, according to traditional healing systems. Ayurvedic medicine suggests that a core component of foods is the ability to cool or warm your body. Cooked vegetables, lentils, cumin, and the process of boiling are all associated with warming the body. This definitely explains your urge for homemade soup in the winter and autumn months. The winter months can get real cold. Warm up with lentil soup, or any homemade soup. Nutrition and wellness are in your hands. Be sure to get your hands on a spoon for your homemade soup, and you will reap every benefit of ditching the can and making your soup yourself. Mercola, J., “Why Canned Soups Can Be Dangerous to Your Health,” Mercola.com web site, Nov. 4, 2009; http://articles.mercola.com/sites/articles/archive/2009/11/24/why-canned-soups-can-be-dangerous-to-your-health.aspx. Colbin, A., Food and Healing (Toronto: Random House, 1986), 80-84. Mateljan, G., The World’s Healthiest Foods: Essential Guide for the healthiest way of eating (Seattle: George Mateljan Foundation, 2007), 265, 275. Haas, E., et al, Staying Healthy with Nutrition: The Complete Guide to Diet and Nutritional Medicine (New York: Ten Speed Press, 2006), 439. Weil, A., M.D., “Organic Foods Have More Antioxidants, Minerals,” Weil web site; http://www.drweil.com/drw/u/WBL02077/Organic-Foods-Have-More-Antioxidants-Minerals.html, last accessed Feb. 7, 2014. Myers, C., “What Are the Benefits of Eating Soup?” LIVESTRONG.com web site, Aug. 16, 2013; http://www.livestrong.com/article/254373-what-are-the-benefits-of-eating-soup/.